I'm looking for a device for drawing. I'm looking for a device that will interface with my computer and allow me to draw as if drawing with a pencil on paper. I'm not much of an artist, but I'd like to draw sometimes. So, I'm not looking for anything professional-grade or super expensive. I don't know much about the topic. Many years ago, I saw someone with a flat pad that looked like plastic. It had a stylus, that was probably electronic and battery-powered, and when he would drag the stylus across the pad, the drawing would show up on the screen. But this was so long ago that this technology might be obsolete. I have heard that some people nowadays use a touchscreen tablet or something to draw with a plain plastic stylus. It's my understanding that this can cause significant wear on the touch screen if used frequently. I don't own a tablet, and never have owned one, so I don't know much about them at all. I normally despise touchscreen interfaces, but I would use it if it's the best way to draw. Is there anyone available who likes to draw casually or professionally who can offer me any recommendations? Is a tablet overkill if drawing is literally the only thing I would use it for? Re: I'm looking for a device for drawing. I was actually looking at this sort of thing in a shop, just two days ago. Just for fun and without reasonable intent to buy. Yet. Thus here is the kind of thing you're looking for on their online store, to give you an idea what to look for in your own locality. Thanks for the reply. A few hours after I posted this, I found out that one of my Steam friends is into graphic design. He told me that he uses a Wacom Intuos tablet for drawing. He seemed satisfied with it, so I'm looking at those and similar devices. I'm only going to be using it for casual drawings, nothing professional, so I'm not looking to spend over $200. The nomenclature is confusing me, because if someone were to say, "I use a tablet for drawing," I don't know if they mean one of these drawing tablets or a touchscreen tablet PC like an iPad or similar. It seems that these flat plastic drawing tablets are still in common use, even though there are other options available (the same Steam friend says he wants to buy a touchscreen-like drawing device that will let him draw directly on his drawing, as he put it, instead of drawing on a blank tablet and looking at the monitor to see the results. But that's far too expensive for my needs). The full name for the plastic peripheral device is "pen tablet". You can use "tablet device" or "tablet computer" to distinguish the other kind of tablet when necessary. Very much above your budget, but mentioning it for completeness: some while ago, Apple released their iPad Pro together with the "Pencil". I didn't try that combination myself, but from reviews it appears to be the bee's knees for digital drawing. I'm not up-to-date with tablet pens, but way back (some 10 years ago) the only cheapish tablet pens that weren't battery-powered were Wacom pens. The others were powered with AAA cells or similar and therefore quite bulky and not like a regular pen. Moreover, cheap models didn't offer tilt sensors, which you will miss when you want to do caligraphy or shading like you're used to with an actual pen(cil). Jplus wrote: Very much above your budget, but mentioning it for completeness: some while ago, Apple released their iPad Pro together with the "Pencil". I didn't try that combination myself, but from reviews it appears to be the bee's knees for digital drawing. ...together with the Surface Pro. New User wrote: I'm looking for a device that will interface with my computer and allow me to draw as if drawing with a pencil on paper. I'm not much of an artist, but I'd like to draw sometimes. So, I'm not looking for anything professional-grade or super expensive. I don't know much about the topic. Many years ago, I saw someone with a flat pad that looked like plastic. It had a stylus, that was probably electronic and battery-powered, and when he would drag the stylus across the pad, the drawing would show up on the screen. But this was so long ago that this technology might be obsolete. I have heard that some people nowadays use a touchscreen tablet or something to draw with a plain plastic stylus. It's my understanding that this can cause significant wear on the touch screen if used frequently. I don't own a tablet, and never have owned one, so I don't know much about them at all. I normally despise touchscreen interfaces, but I would use it if it's the best way to draw. Okay, there's a lot of technologies out there. Obviously, the best is the $2000 Cintiq QHD but lets go with an overview of the technologies. 1. Simple Stylus -- Either Resistive (Nintendo 3DS) or Capacitive (Early Galaxy Note). These are... not very good and not suitable for serious drawing applications. At best, these simple designs inaccurately tells you the location of the stylus, and that's about it. 2. Active Digitizer -- Between $80 and $300, depending on the quality and size. Wacom sells these as the "Intuos" series. The stylus has a radio inside of it, and many sensors running across the tablet are constantly triangulating the position in a precise manner. Futhermore, the tip of the stylus is pressure-sensitive, and often is designed to feel like "a real pencil". 3. Active Digitizer WITH a screen -- Surface Pro / iPad Pro synchronize a screen to the pen, and its honestly extremely impressive that this technology is available. So Surface Pro / iPad Pro are definitely recommendations if you also want a computer. But a serious art solution like the Cintiq 13 HD is far, far superior ($800 + more for attachments and extra pens). * Tilt Detection -- iPad Pro and "Intuos Pro" have tilt detection, so that you can "paint" with calligraphy. If you are a serious pencil artist, being able to "switch widths" by simply tilting your hand is extremely natural. Tilt-detection is necessary for proper synchronization with the screen and maximum accuracy. * Physical Photoshop bindings -- For example, you can buy multiple pens with a Intuos and bind them to different Photoshop tools. One pen can be an eraser, another pen can be "smudge", and a 3rd can be paintbrush, and a 4th can be pencil. The Surface Pro's pen is double-sided, with the "eraser" typically being bound to the back-end of the Surface Pro's stylus. If you're serious about this, the Intuos is the cheapest you should by. It won't have tilt-detection or a screen-synchronization, but it should be good enough to get serious drawings done. Intuos Pro is a bit more luxurious at $250 (but including tilt-detection and lots of buttons for photoshop bindings). I'd say Intuos Pro is the entry-level for the serious art student. In any case, you'll want to also budget out Photoshop or whatever program you plan to use. Its not like Corel Painter or Photoshop are cheap. You can get pretty far with GIMP, and GIMP works with Intuos to some degree. FYI: $50 will get you pretty damn far with Pencil and Paper. Any reason why you aren't going to just buy a good pad of High-quality Vellum and a set of graphite pencils and/or a nice drafting pencil?? When you're done with a pencil drawing, just scan it in with an office scanner. Last edited by KnightExemplar on Tue Aug 08, 2017 6:40 pm UTC, edited 1 time in total. KnightExemplar wrote: * Tilt Detection -- iPad Pro and "Intuos Pro" have tilt detection, so that you can "paint" with calligraphy. Per a link posted upthread, the latest Surface Pro has tilt support as well. Tilt-detection is necessary for proper synchronization with the screen and maximum accuracy. At least some people would disagree with you; e.g., Gabe from Penny Arcade talked a lot about how much he liked the Surface before it had tilt support. That said, of course both the Surface Pro and iPad Pro will be out of your budget. Gabe is a professional artist, so I need to be careful when disagreeing with him. 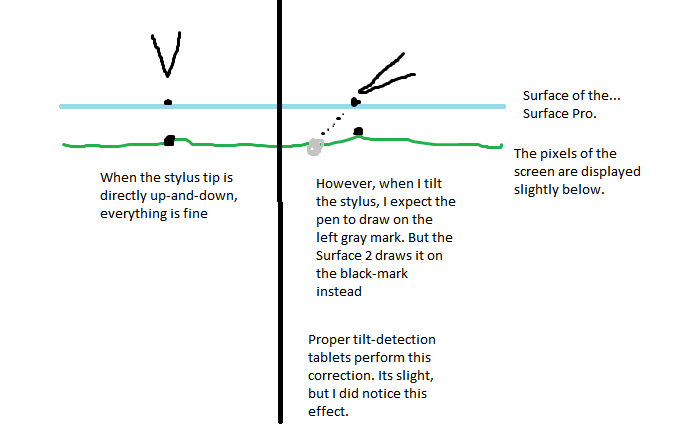 I also haven't used the latest Surface pen, so I'm not sure if the added tilt support degraded its abilities elsewhere. But with regards to say, the Surface 2, which I have used... the screen was slightly off sync with the pen, especially when the pen was tilted. I can imagine that someone who has practiced writing with the Surface 2 might prefer the Surface 2 behavior over time. But my natural instincts prefer the tilt-detection. I can agree that this sort of feature might be more of a "personal feel" thing. In either case, the mouse-cursor moves with the pen, because the active-digitizer tracks you even when you're an inch or two above the tablet. The radio trangulation thingy is amazing. So be sure to get an active digitizer regardless. I know it's been over 6 months since the last post, but there's quite a bit of info that I feel is missing that might help someone in New User's situation down the line. First, Wacom tablets are indeed awesome for digital art, but lately, I've been hearing pretty good things about Huion. Namely that, while not necessarily as good as Wacom, their drawing tablets (both pen tablets (the blank tablet ones) and pen displays (those with an integrated screen)) are still pretty damn decent, while being significantly cheaper. Quick warning, though, pen tablets take some getting used to, due to the disconnect between the hand and the eye. They're basically a mouse replacement that holds like a pen. On the software side, GIMP is, indeed, free, but so is Krita, which, unlike GIMP, was designed from the ground up as a digital drawing/painting program. I switched over a few months ago, and never looked back (GIMP is still my go-to for touching up photos and the like, but for drawing? Krita all the way). Bottom line is, to give digital art a try, you can get some decent pen tablets for $100 or less. Wacom is usually the go-to recommendation, but there are viable (and cheaper) alternatives. Software-wise, while many professional artists will jump straight to Photoshop, alternatives exist, of which Krita is the best I've seen so far. Thanks. I got Wacom Intuos Draw a few months ago. It seemed like a beginner-tier tablet. I find it difficult to use. I think I can still draw just as good and maybe a little faster with a computer mouse. I haven't heard of Krita, but I'll try to remember to check that out when I have time. I know it's a bit late (since you already made your purchase) but for the record, Apple's new line of iPads now support the Apple Pencil even on the cheaper models. It's around $330 for the iPad itself, plus a little under $100 for the Apple Pencil—so probably over your budget, but if you are a student or a teacher you might be able to get a discount on the iPad, and for students and teachers the Crayon stylus is only $50. I've been using the Apple Pencil with an iPad Pro for about a year now and it's fantastic (I've stopped using my Wacom tablet entirely). That said, give the Wacom some more time—with practice, it becomes much more natural that a mouse. Also, make sure your scaling and other parameters are set up right; if the tablet is small and you have it scaled to the full screen, it can be hard to draw precisely. karhell wrote: I've been hearing pretty good things about Huion. I concur. I have a Huion pen tablet, and while it took some getting used to, it is very handy. For lower-end stuff there's no significant difference between Huion and Wacom tablets, although I do have to mention that the software support is better for Wacom - I've spent some time battling driver installation for Huion, since I couldn't install drivers from the CD that came with it.